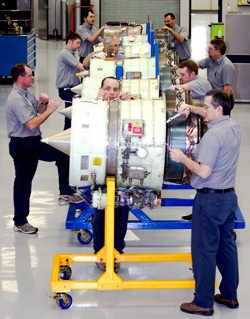 There are 15 technicians at our Lincoln, Nebraska and Battle Creek, Michigan facilities who have worked on turbine engines at Duncan Aviation for more than 20 years. They have touched hundreds of Honeywell, Pratt & Whitney, General Electric, Rolls Royce and Williams’ engines. They have worked untold hours exchanging engine parts, performing non-destructive testing and MPIs and repairing or overhauling engines. They have the technical know-how, tooling, training and industry contacts to offer nearly comprehensive services for your turbine engines. All of those years and all of the engines add up to an impressive amount of experience. Because of this experience, our customers trust us with their engines. We can troubleshoot, replace line replacement units (LRUs), do performance runs and change engines. With our state-of-the-art equipment, we can also troubleshoot and change auxiliary power units (APUs).